Read the Reviews! Private Walled Compound. 4 Deluxe Bedroom Suites. 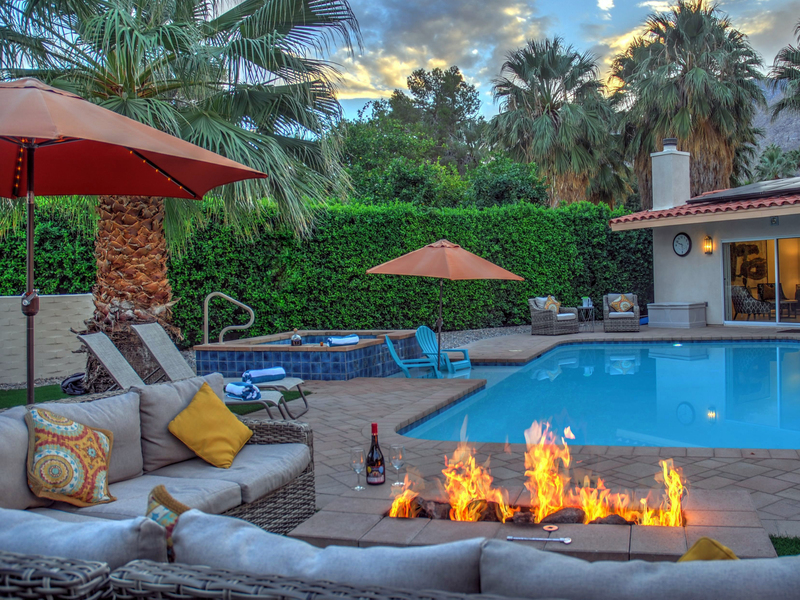 Very private yard w pool, spa, fire feature. Mountain views. Walk to town, and Chabad. Covered off street parking. 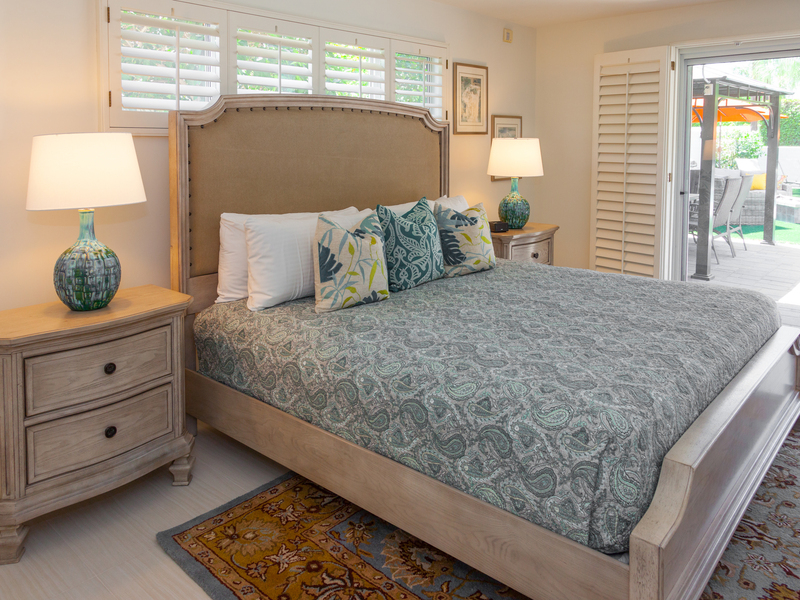 Beds: K, K, K, K (converts to 2 T)Quick stroll to the world famous Palm Canyon Drive. Beautifully landscaped and completely walled for privacy, this gorgeous setting features mature plantings, towering Palm Trees, a huge front garden and a gorgeous country club yard with a new pool, spa, fire feature and outdoor shower. This property is so lush and quiet. 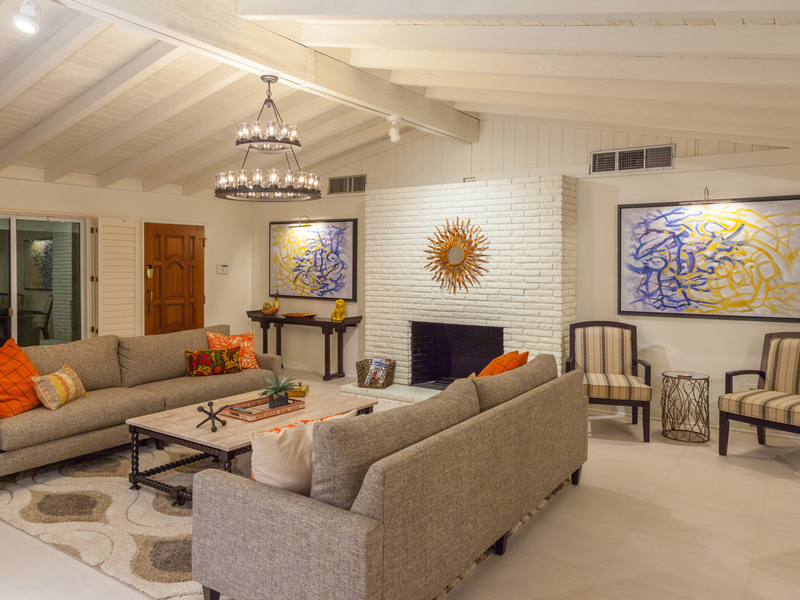 You will almost forget you are just a quick stroll from the newly revitalized, hip and trendy South Palm Springs Business District with its casual and fine dining, cabarets, boutiques, grocery markets and other neighborhood conveniences. 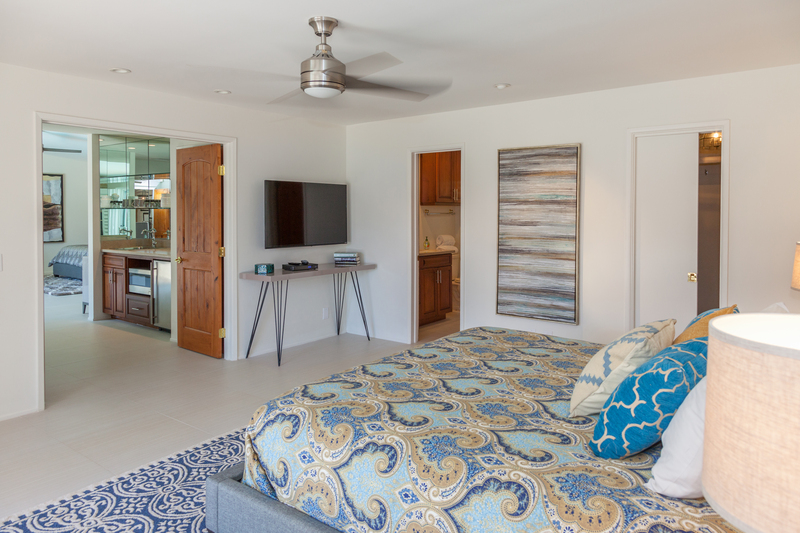 The owners preserved the gorgeous wood doors and plantation shutters while adding new baths, all new floors, hi speed internet/wifi access, and five large screen Smart Televisions. 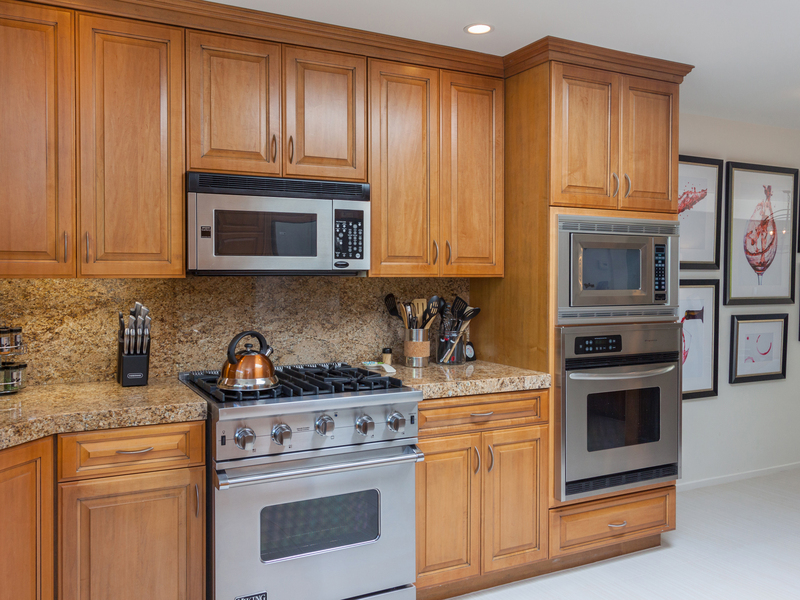 The kitchen has been updated with granite countertops and stainless steel appliances. 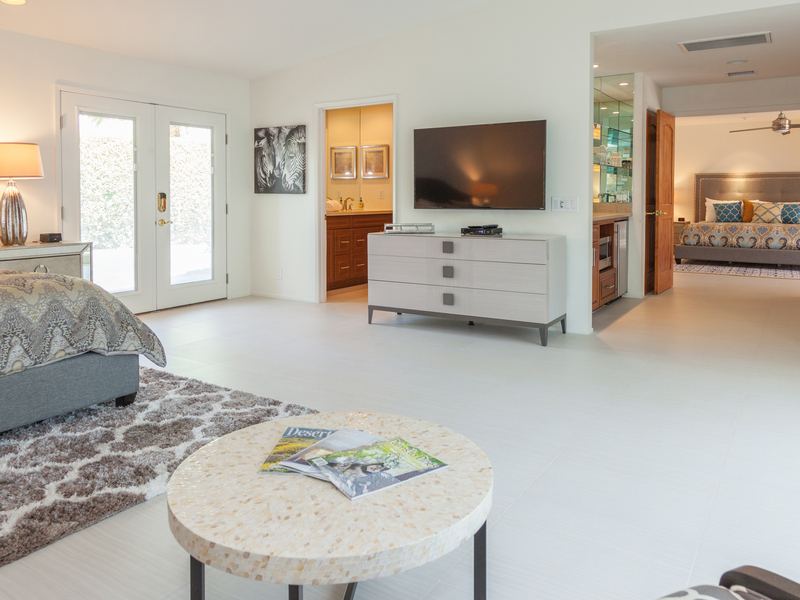 Professionally decorated by an award-winning design team - you'll find rich contemporary furnishings mixed with traditional pieces and an impressive art collection that creates a comfortable but sophisticated look - as though it was torn from the pages of House Beautiful, Luxe Magazine or Veranda. Hidden Haven is paradise found. The open concept floor plan, dramatic high ceilings and huge windows provide the perfect place for gathering as a group. 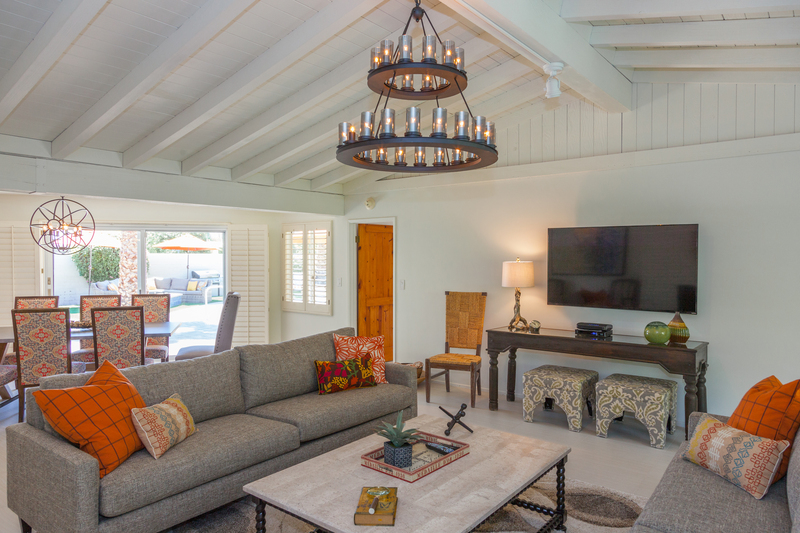 Two large custom sofas flank the slumpstone fireplace - perfect for long nights of conversation or watching a movie on the 60" flat screen television. There are a few other seating areas for private moments off to the side. 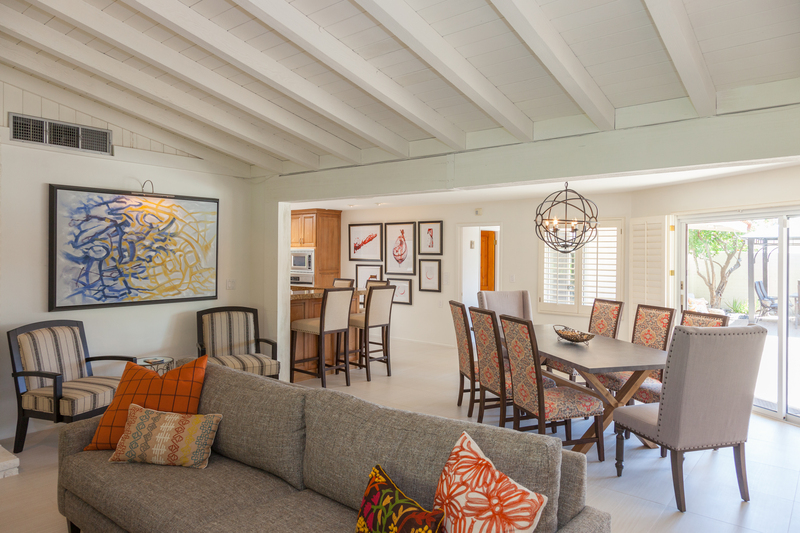 The spacious layout of the living areas also includes interior dining for eight, a bar area and chef's kitchen. 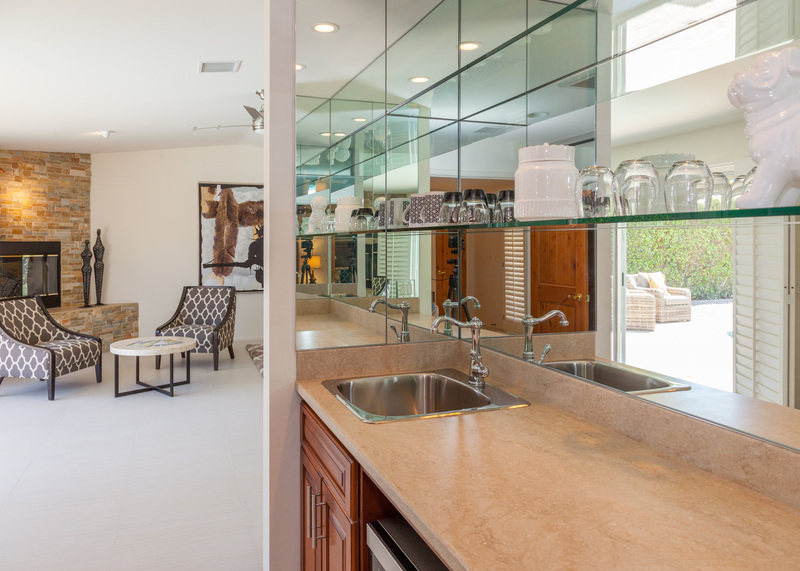 Tucked away off the kitchen, removed from the open concept living space - the owners created a recreation space with a billiard table and laundry room. 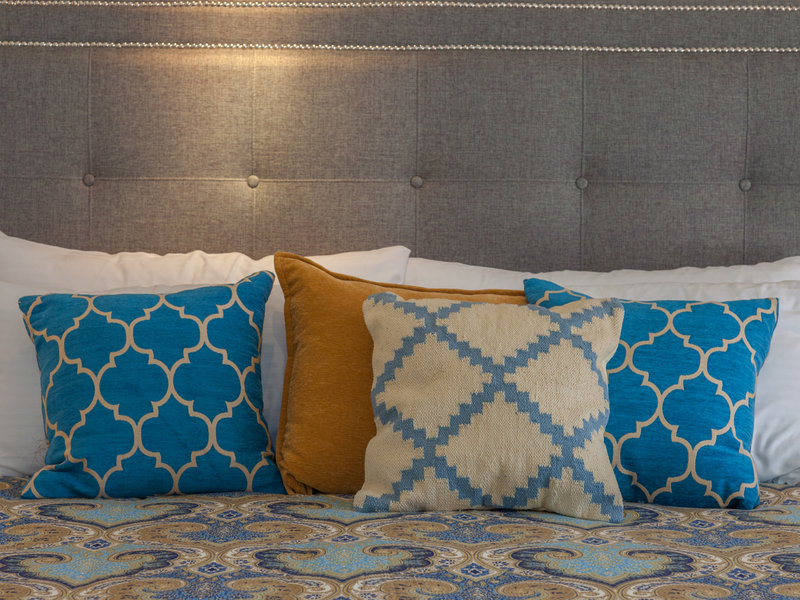 All four of the bedroom suites feature hotel-quality mattresses, ample storage, flat screen televisions and full en suite baths. 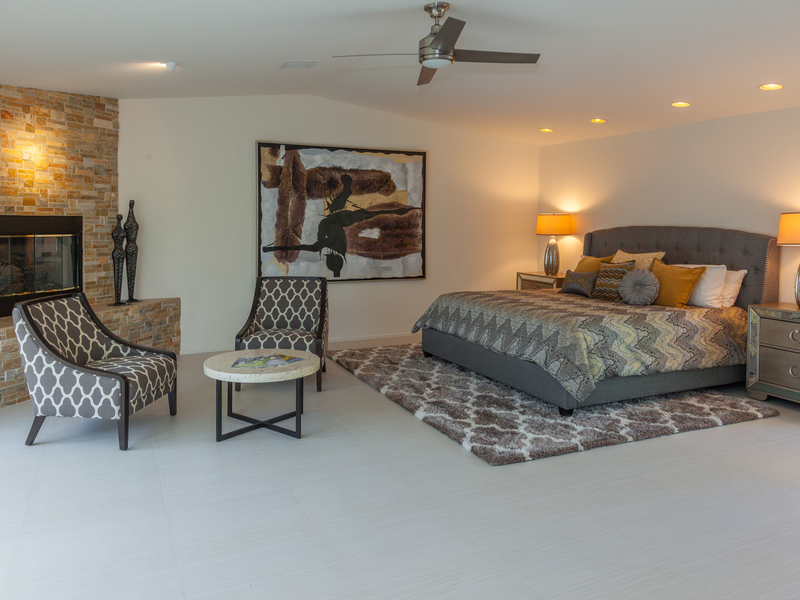 The bedroom suites are split for privacy - two on the east wing of the home and two on the south wing. 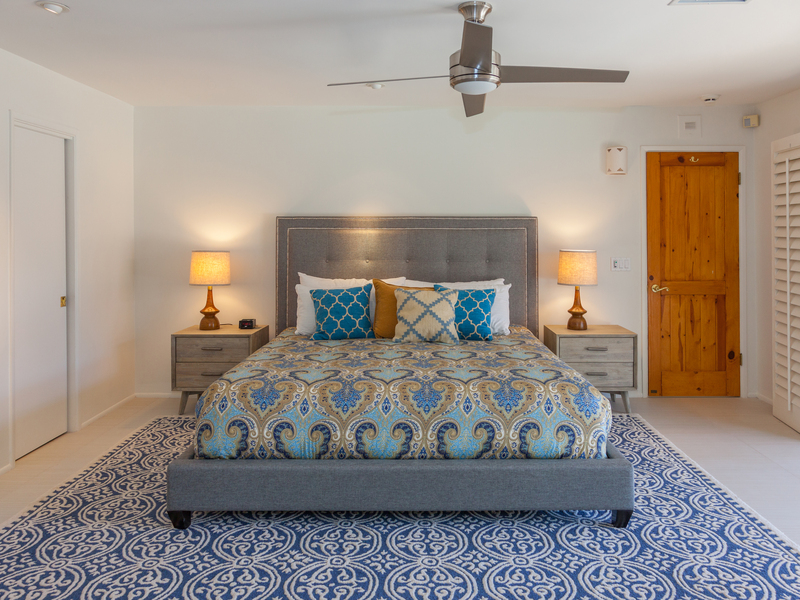 The first master, located on the east wing, has a king-sized bed, direct pool access and an en suite bath with a walk-in shower. The other guest room on this wing has two twin beds that can be converted into a king bed with advance notice and private dual access to the hallway bath with shower. On the south wing there are two deluxe masters that can be offered family-style, with the connecting doors unlocked, or as completely separate suites. The first master on this wing has a king-sized bed, a fireplace, a morning center with wet bar, wine fridge and coffee maker, and an en suite bath with dual vanities and a walk-in shower. This suite has direct pool access plus a mountain view garden patio. 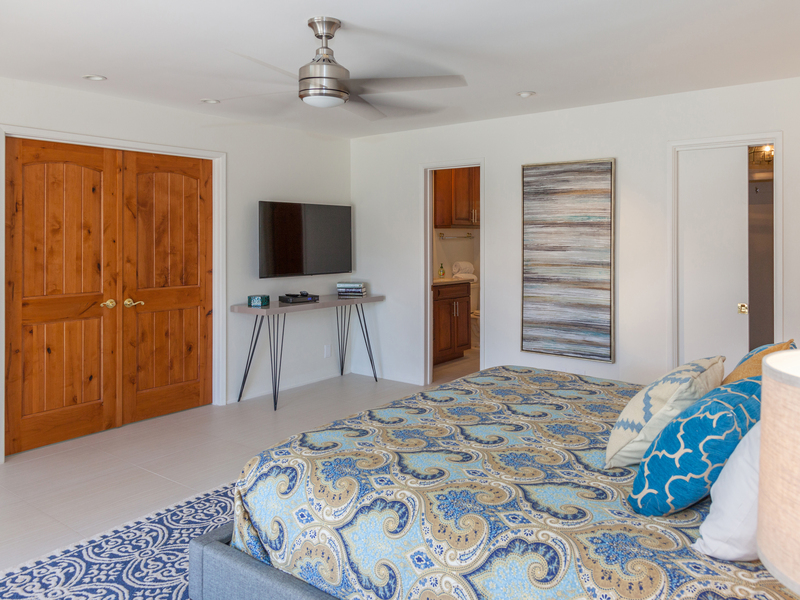 The second suite on this south wing offers a king-sized bed, a walk-in closet, direct pool access and an en suite with a shower/tub. 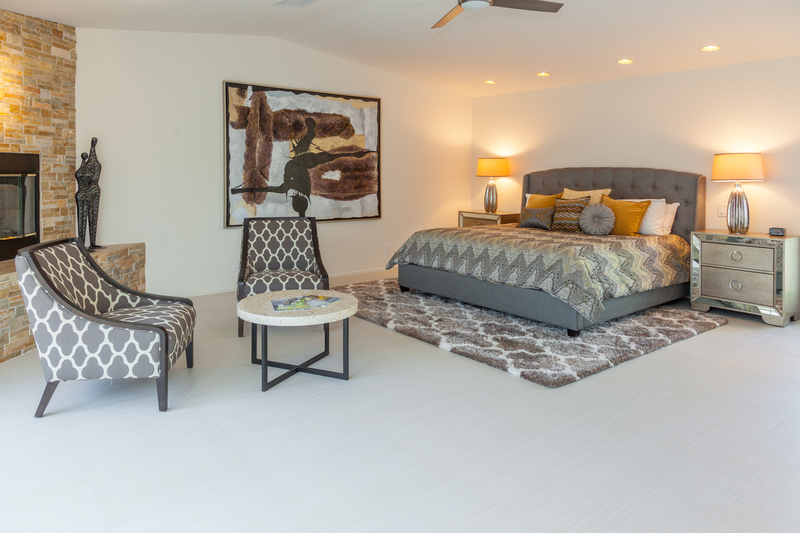 All four of the bedroom suites are spacious and handsomely furnished - giving each its own individual style and appeal. The windows and sliders along the entire back of the house reveal the gorgeous resort-style pool yard - blurring the lines between indoor and outdoor living. 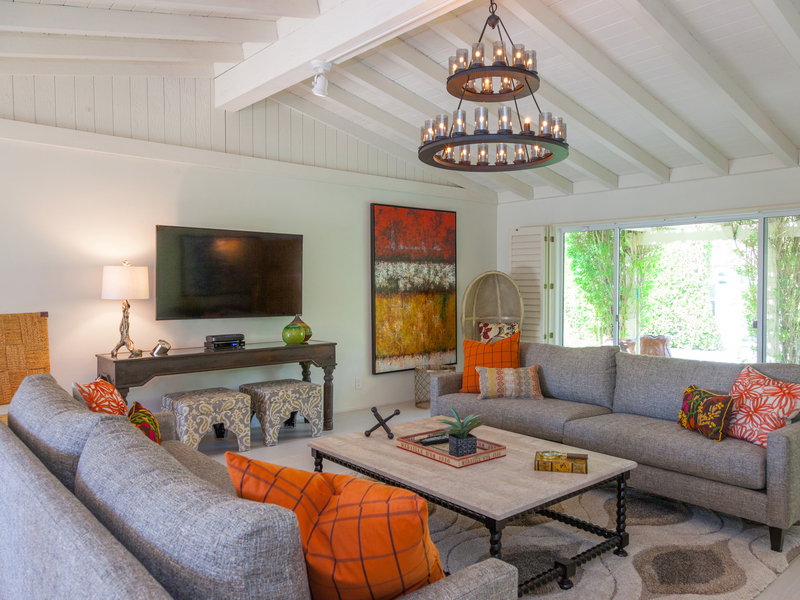 As gorgeous as the interiors of this home are - it is the outdoor living areas that are its crowning glory. 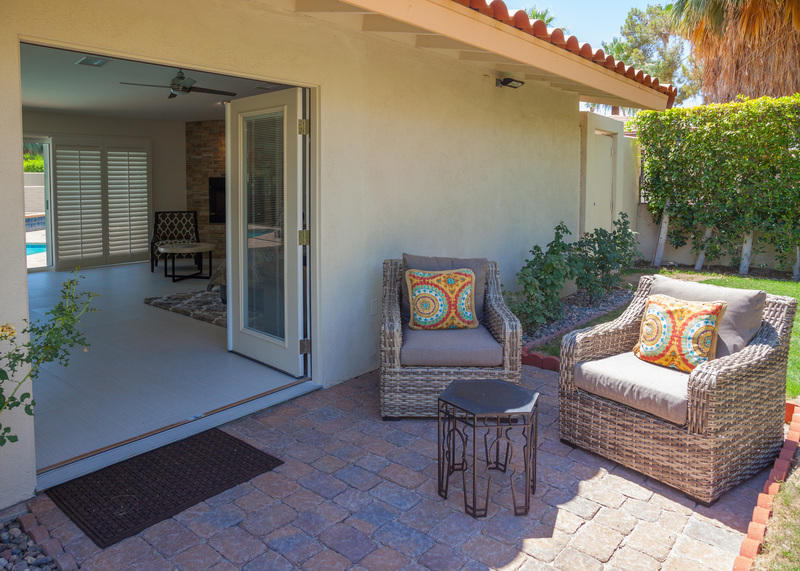 From the outdoor living room with its comfortable sectional sofa and fire feature coffee table to the covered dining pavilion and plumbed gas barbecue - you'll find that the owners have thought of everything - even an outdoor shower. The saltwater pool with its tanning deck and integrated waterfall spa is absolutely stunning. Sip your morning coffee while enjoying majestic mountain views from three different sets of reading chairs. Fabulous house for a celebration! "My family and I stayed at Hidden Haven for a 4 day celebration of my 70 th Birthday, it could not have been better. The house is lovely with a perfect back yard, beautiful pool and seating area around a gas fire which we really enjoyed in the evenings. It is very well equipped with everything you could want for 8 people. 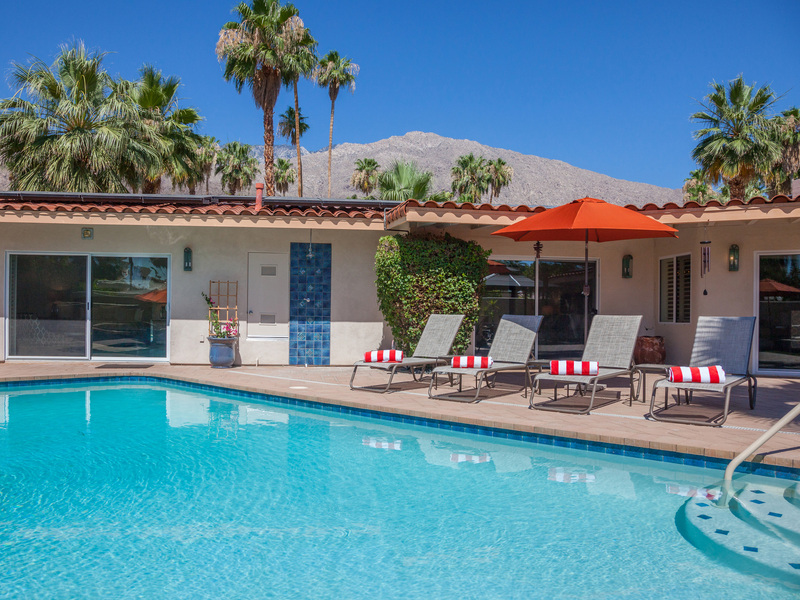 For most of us it was our first visit to Palm Springs and Hidden Haven couldn’t have been in a more convenient location, 8 minutes from airport and within walking distance of great restaurants and shops." "All was perfect ! location, cleanes, very good service !! Tks!" 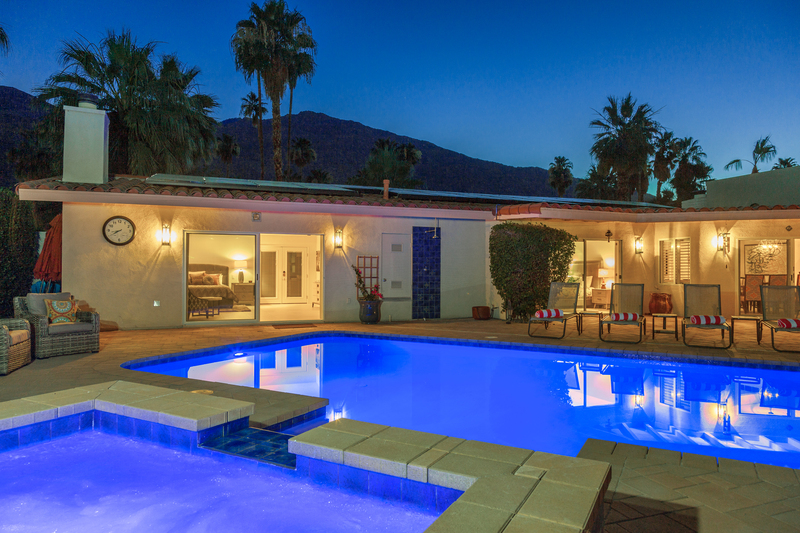 "Great home for family retreat in palm springs. House is well maintained and very spacious. The pool was very refreshing for the hot weather, and kitchen had all we needed. 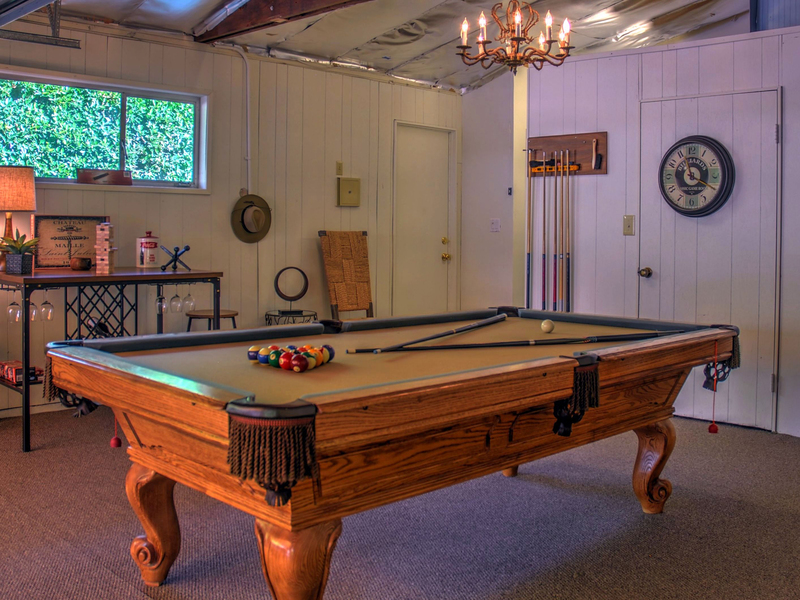 All rooms have bathrooms which was a plus and kids enjoyed pool table in garage. Acme House Co was very quick to respond to a maintenance request even on a late Saturday night." 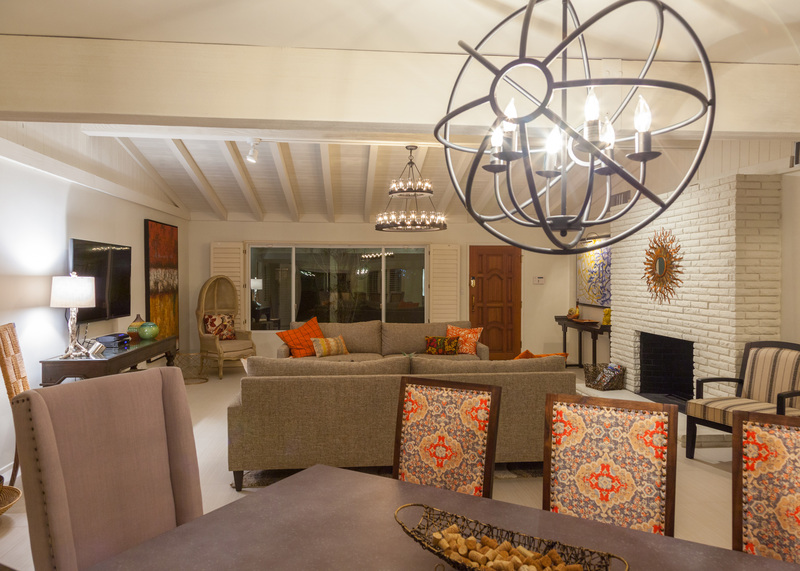 "By far the best vacation home rental experience our group of friends have had over many years of travel. 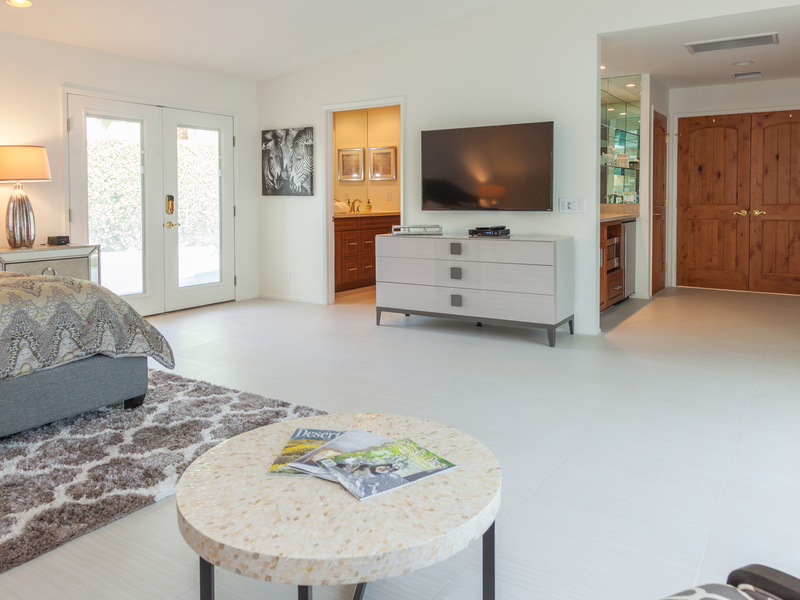 Everything was superbly cleaned, maintained, and most of all felt like a dream home. 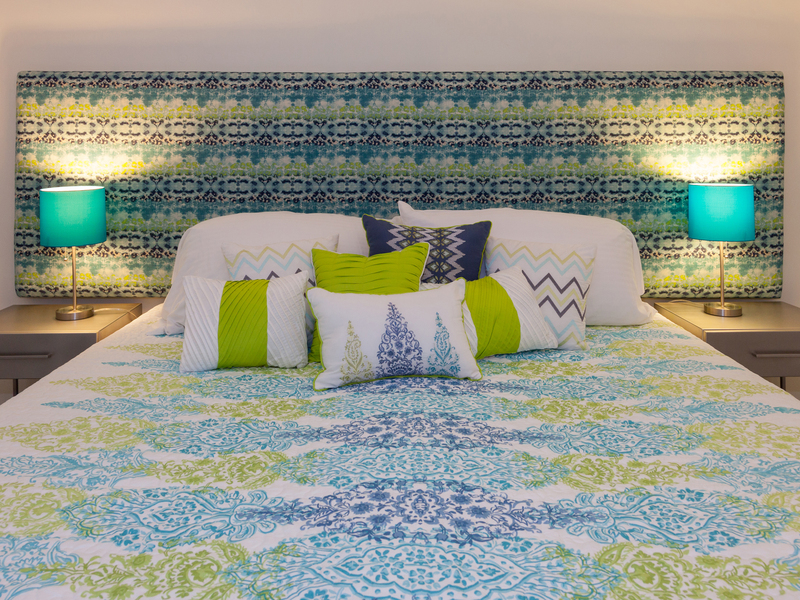 We barely wanted to leave the house and would/WILL definitely book again." "Nice accommodations! The pictures represent the house perfectly. Nice customer service from ACME House Co.! The best part was the pool and outdoor living space! A great time! " "Picked this home because of the size of the property, and the cost! The best parts were the towels for the pool, and the well stocked pantry items, the cookware available, the grill! Were cool the entire time. Thank you for being an awesome rental company. " Wow, what a house, what a view! "The house had all the necessities needed for our family. 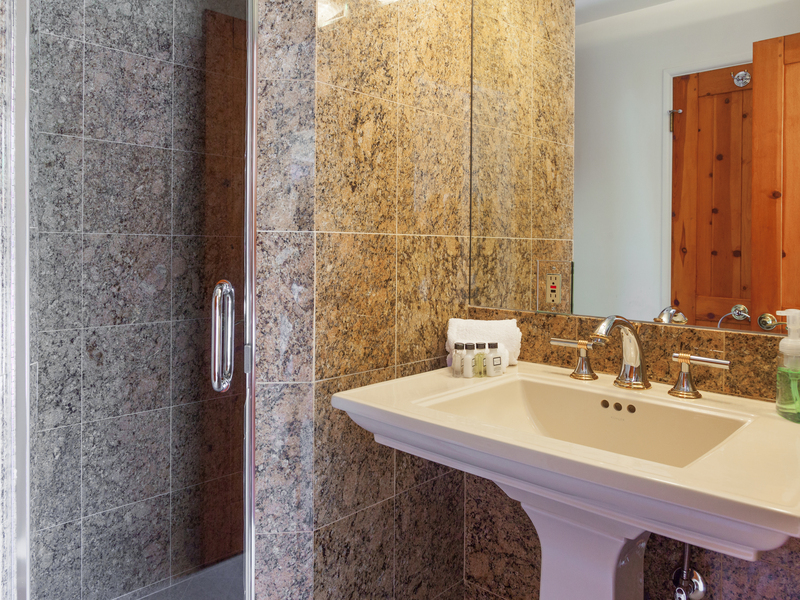 Loved having king suites in each room having its own bathroom and privacy. Every room had access to the balcony & pool. They really gave it a lot of thought when decorating & setting up this home. Nice & comfortable The pool & spa was great. I loved the views of the beautiful backgrounds from the bedroom patios. I also enjoyed the privacy of the home. 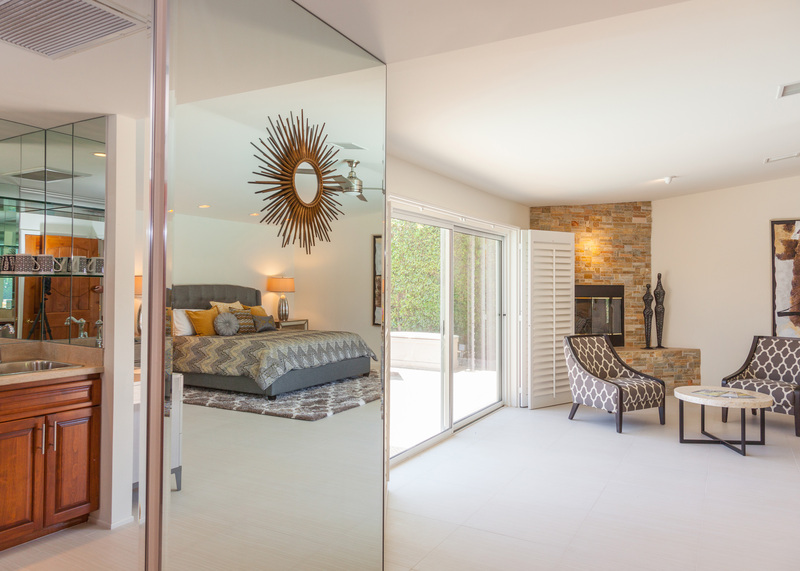 The biggest surprise was that almost every room had patio access through sliding doors that practically wrapped around the whole house which provided so much sun light and beauty. 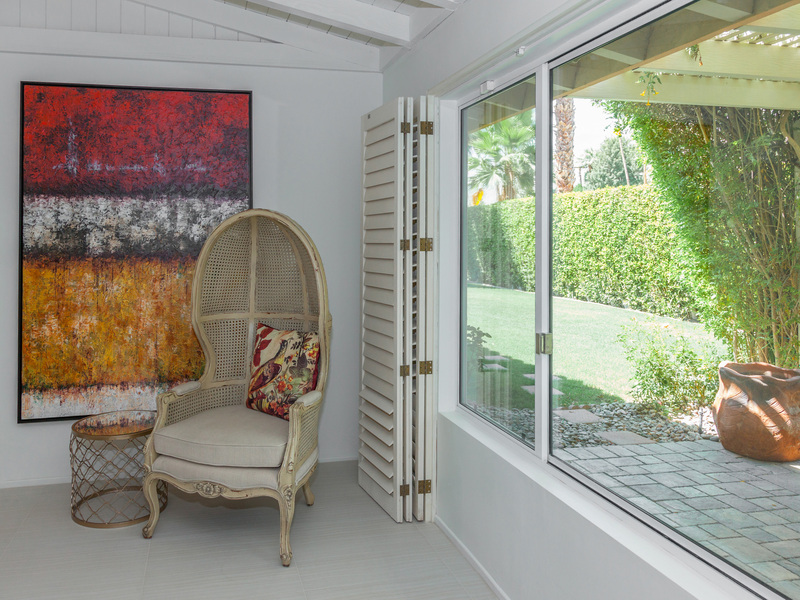 There was seating inside & out for guest to enjoy every inch of the home. It was also a pleasant surprise to find that we didn't have to buy anything. Everything was provided in the home. We only had to buy food! Everyone enjoyed there stay." 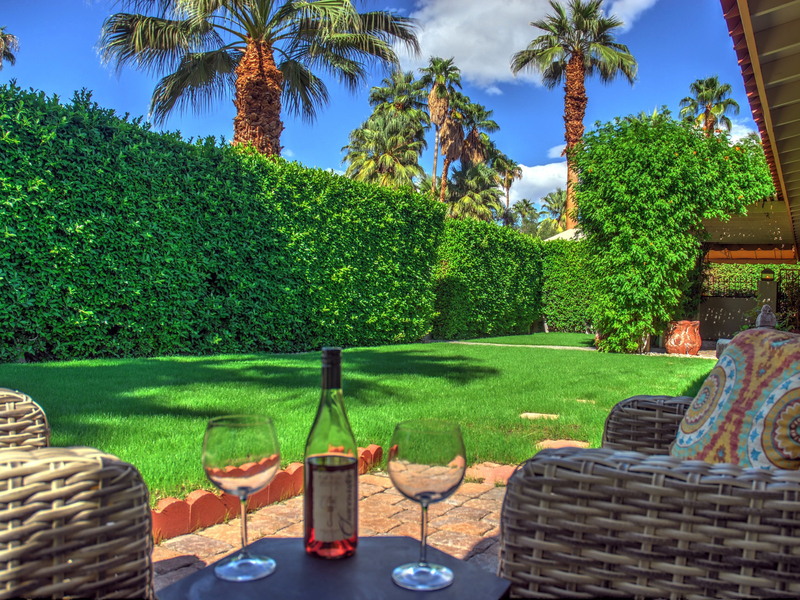 Manager Response: Thank you Christine - Hidden Haven continues to be one of our most popular Palm Springs vacation homes. We are glad to know you had a wonderful time. You and yours were great guests and we look forward to you staying with us again. 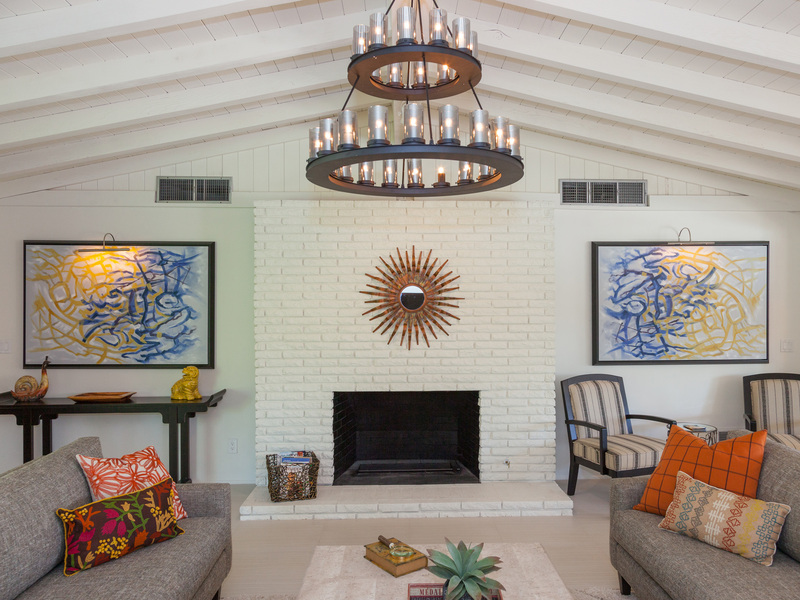 "The decor in the pictures was inviting, the home had a lovely, and great atmosphere inside and outside as well. 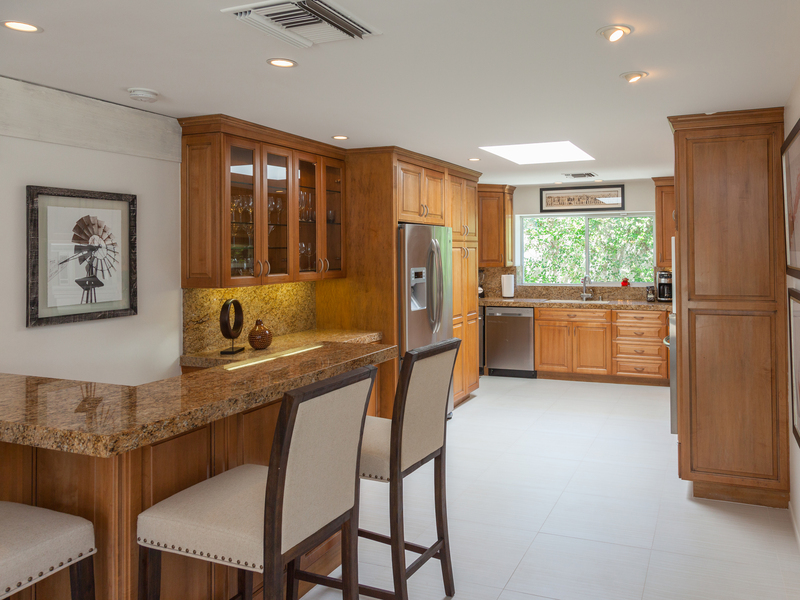 Plenty of room, relaxing decor, and a kitchen that was stocked well. A beautiful, warm and inviting home. There were 8 of us here, and it was a perfect fit!" "We've rented several house in the area before, but always with private owners. Going with a professional management team seems to be the better choice, and we will defiantly use ACME House Co. again, in the future. Really appreciated how quickly the management team responded to any questions or concerns! The house was perfect for 6 people, and all the rooms were very comfortable. The pool and hot tub were amazing!!" "ACME House Co. has always provided me great service in the past. Loved the overall comfort and layout of the pool area. Surprised we had to walk through another bedroom to get to the South master. Excellent overall stay!" Manager Response: Thanks for staying with us again Bob! In response to your comment about the South Master - yes that room does have flexible access. 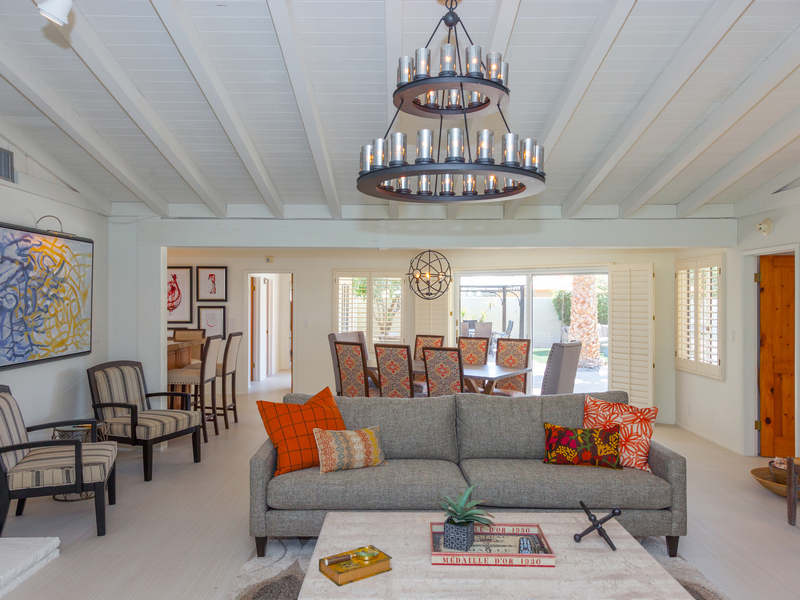 In addition to the fireplace, ensuite bath and sitting area, it has its own private entrance off the pool and another off the front court yard allowing guests to use it as a separate casita. 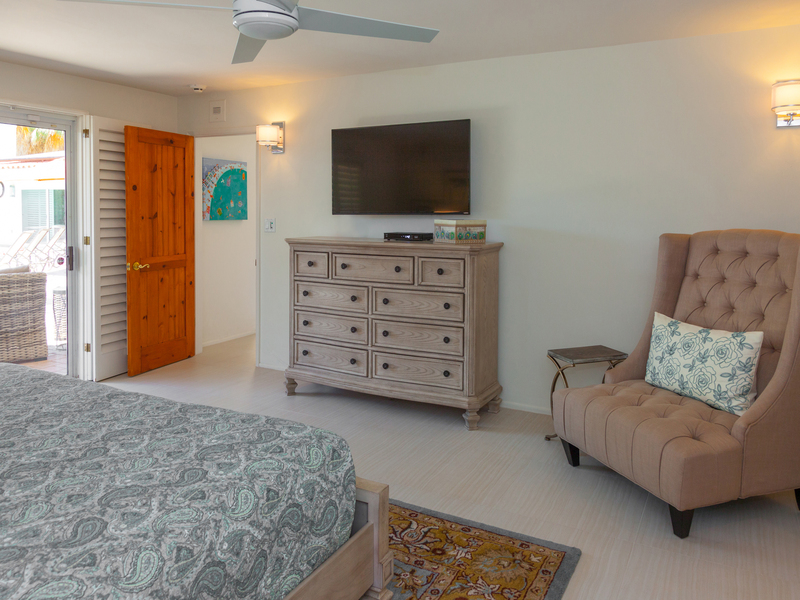 It also has a set of interior double doors that can be unlocked and opened to connect to the adjacent suite for those families who want to use the entire South Wing as a two-bedroom / two bathroom family suite. "Great 4 bedroom house. The best part was the pool The biggest surprise was the well stocked kitchen! Your early check in and late checkout fees are exhorbitant. That could be a detriment for future bookings. " Manager Response: Thanks for the feedback Natalie. Glad you enjoyed your stay. As you know Hidden Haven is a beautiful and very popular property. 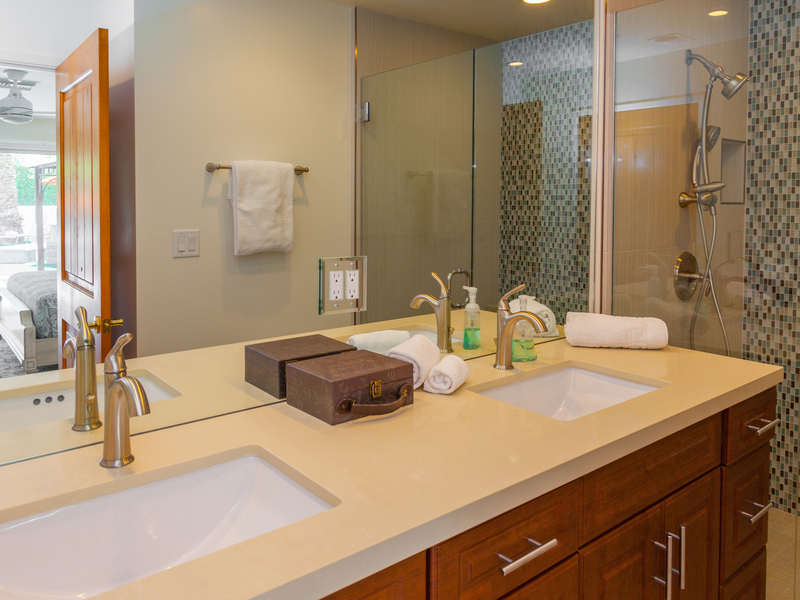 And you also know we leave enough time between guests to keep our homes super clean and well maintained. 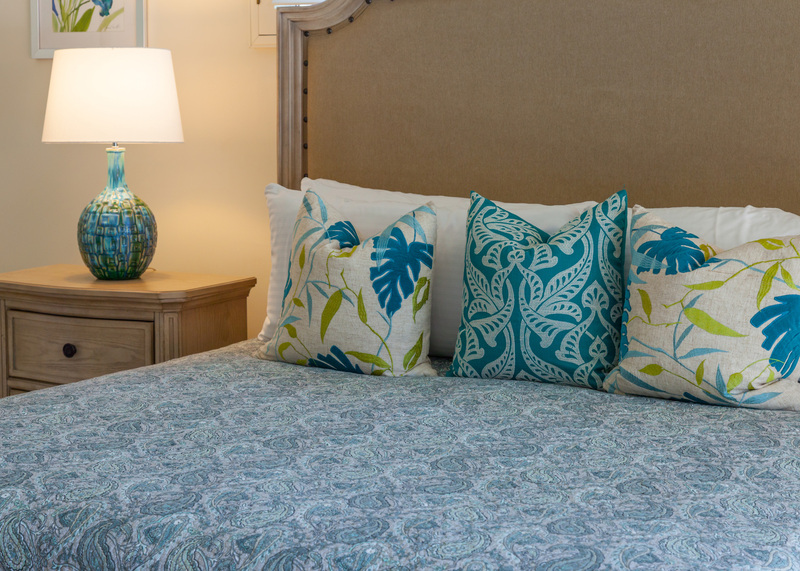 When there is an early check-in or check-out - it means we have to double or often even triple the housekeeping staff to get the property ready for the next guest. We hope you can understand that the next guest (and sometimes that could be you) wants to arrive at ship shape property. 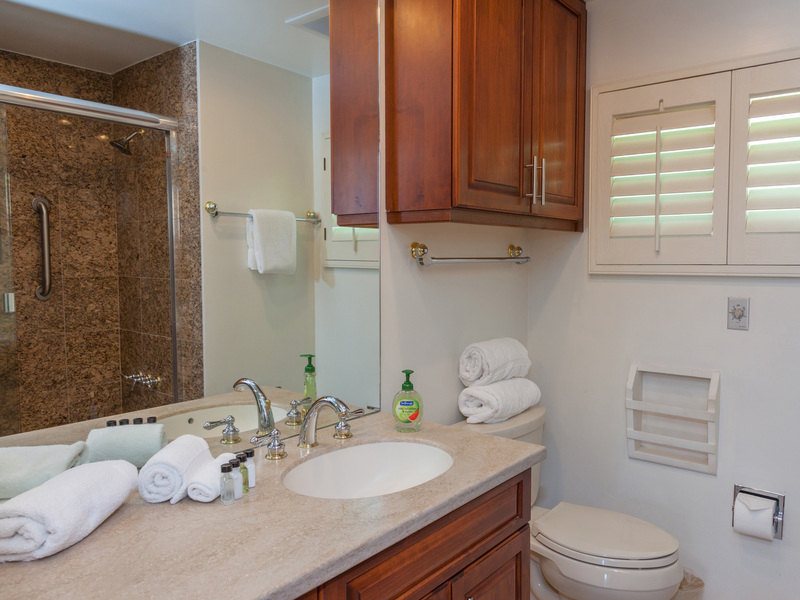 "We have stayed in so many vacation rentals over the years. Many in Palm Springs thru various management companies and owners. This is the first time that we felt we got the deal of the century. All seven of us agree - Hidden Haven gets "14 Thumbs Up!" Acme made the entire experience seamless, easy, and very very pleasant. The property is gorgeous. 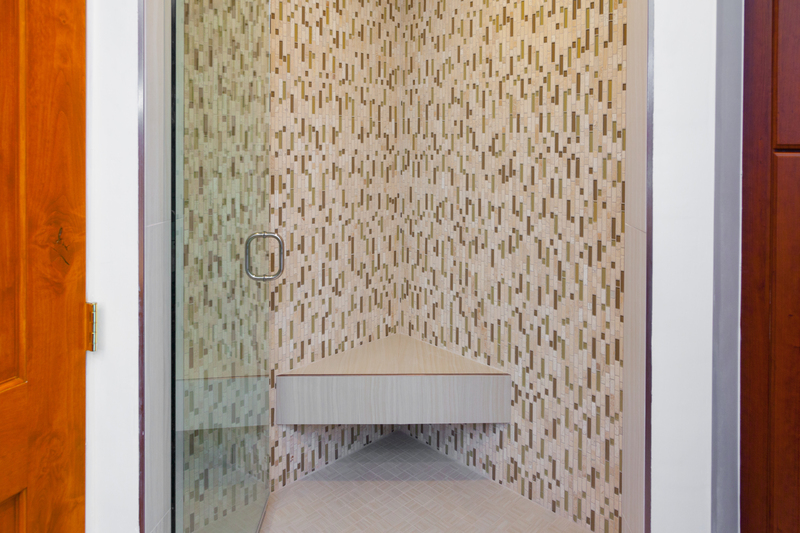 Completely walled for privacy. The pool yard is huge and loaded with all the good stuff including a great pool, spa, outdoor shower, firepit, and covered dining. The location was great. We took off one star because we couldn't get a late check in or check out because the house had back to back bookings. We really needed to stay another half day and that wasn't an option. But other than that this was the perfect vacation." 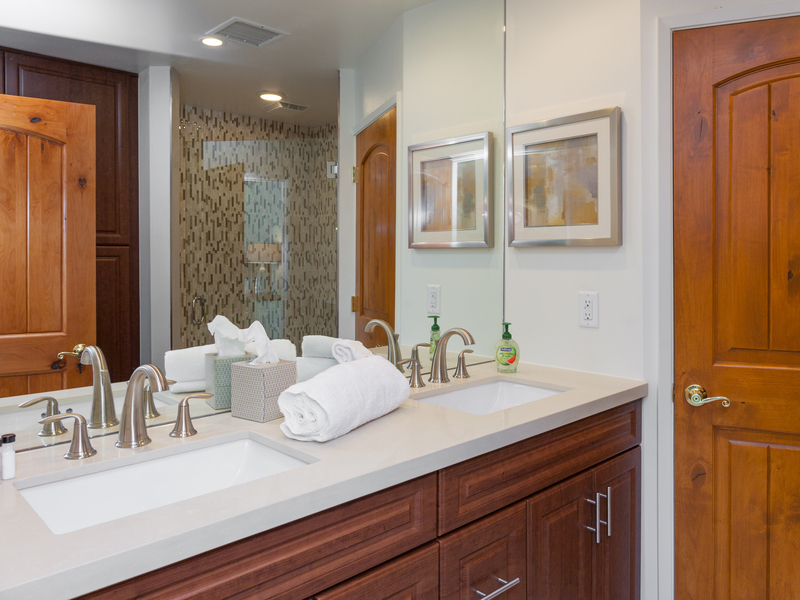 "House was spacious and comfortable. Pool was big and the kids were able to swim without being on top of each other. Rooms were nicely decorated. 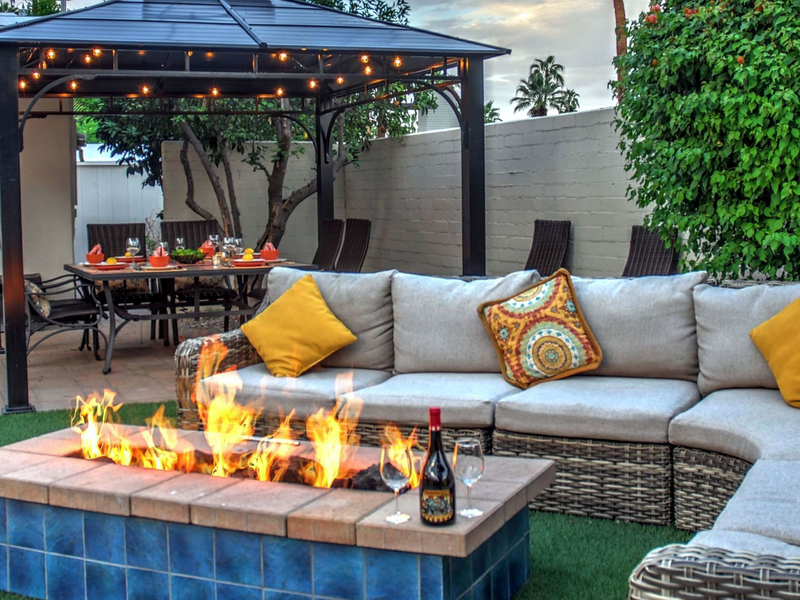 Great outdoor space for entertaining. Close to downtown but in a very quiet neighborhood. I cooked almost every meal for our big family. BBQ, two ovens, two microwaves was more than enough. Viking range was great. " Good price, beautiful home ! "The house had all we needed! We were very comfortable staying here! Thank you! I will definitely rent from Acme again! " "It had exactly what we wanted: 4 bedrooms, 4 bathrooms, and a pool. Great location to downtown, and to the mountains. 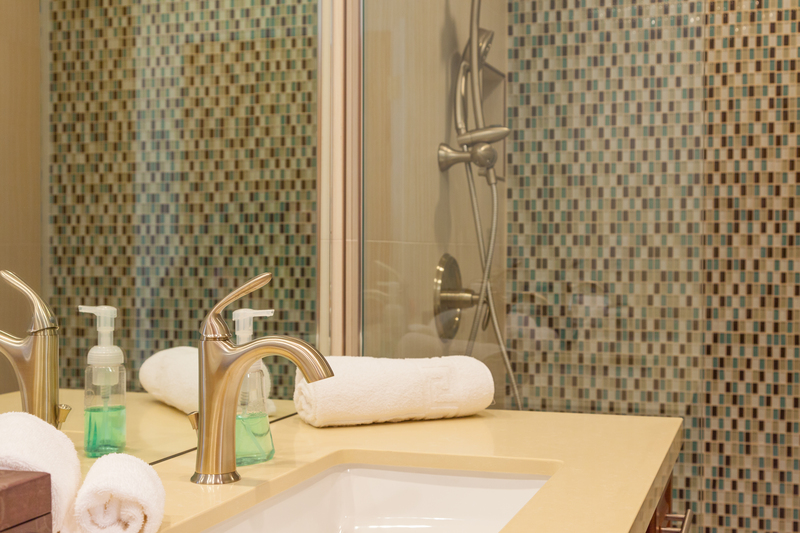 The best part was the fully stocked kitchen, the heated saltwater pool, and plenty of towels! We had a great time. Loved Hidden Haven. We hope to return. Thank you!" "We would choose ACME House Company. 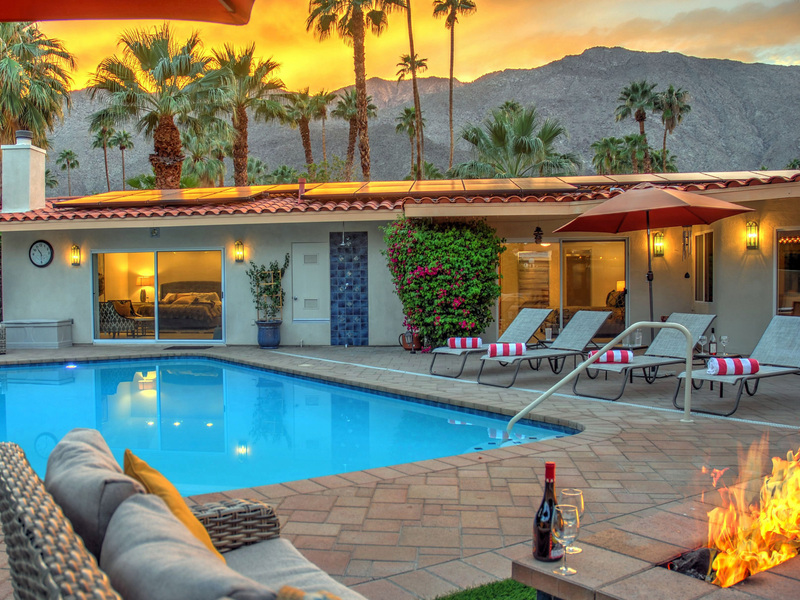 again when we stay in Palm Springs in the future. Very convenient place for shopping. Hidden Heaven is absolutely a "Hidden Heaven."" "Each Acme property (I've been to 3) has been superb. Ideal for what I needed at the time. My birthday. A getaway for my family and Hidden Haven was a great set up for meetings and an event that was nearby for the six of us that stayed there. Love Acme!" "Awesome! We would choose ACME again when we stay in Palm Springs in the future. Very convenient place for shopping. HiddenHeaven is absolutely a "Hidden Heaven!"" "My husband and I recently took a break from the cold Texas winter and headed out to Palm Springs to soak up some much needed sun. We LOVED Hidden Haven! It offered above and beyond anything we could have hoped for. Everything was truly a pleasant surprise. 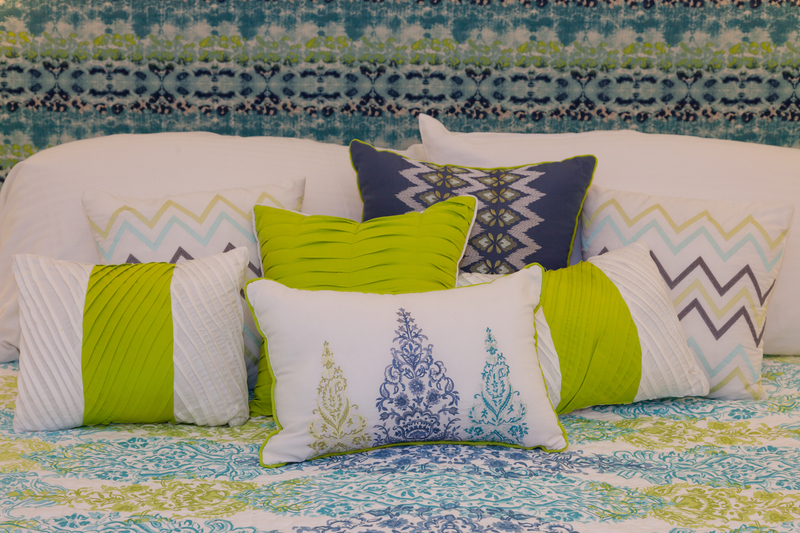 We have traveled many places and multiple countries and so consider ourselves to be a tiny expert in comfort. We like high end places and also enjoy quaint get aways. Hidden Haven offered us both! I felt like the amenities are very 'high end' feeling and yet the cozy was very quaint. The very convenient location to town was wonderful. Either an enjoyable stroll or brisk walk either way you are close enough to town to never back the car out of the drive way. The Buzz - the bus that complimentary runs Thurs-Sun I believe, makes heading home at night an easy decision to stay out late and not take the car. 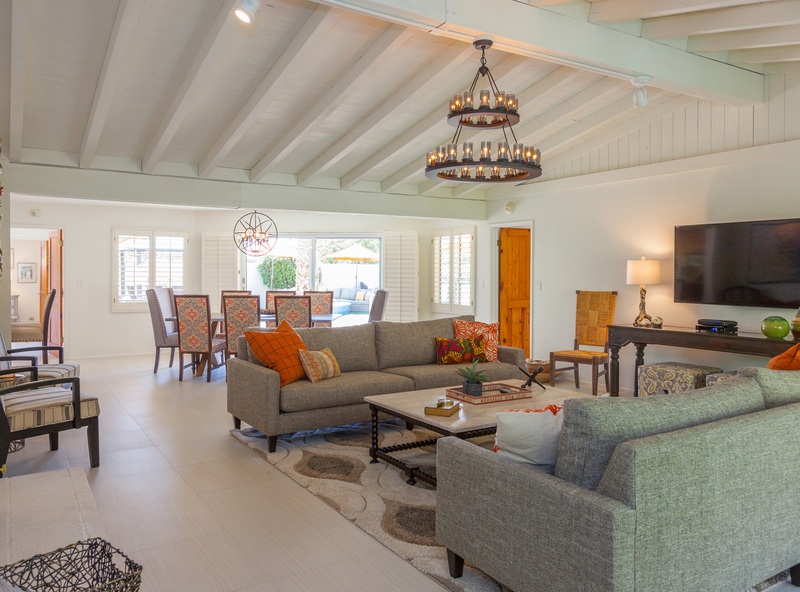 The owners have really out done themselves in decorating this home to make you feel like you are on a true "resort/luxury/cozy" vacation. If you are like us we want it all! The backyard pool offered the resort, the rooms offered luxury/cozy, and the overall property gave us cozy! Hats off to the owners for cleanliness too. No stone left unturned! 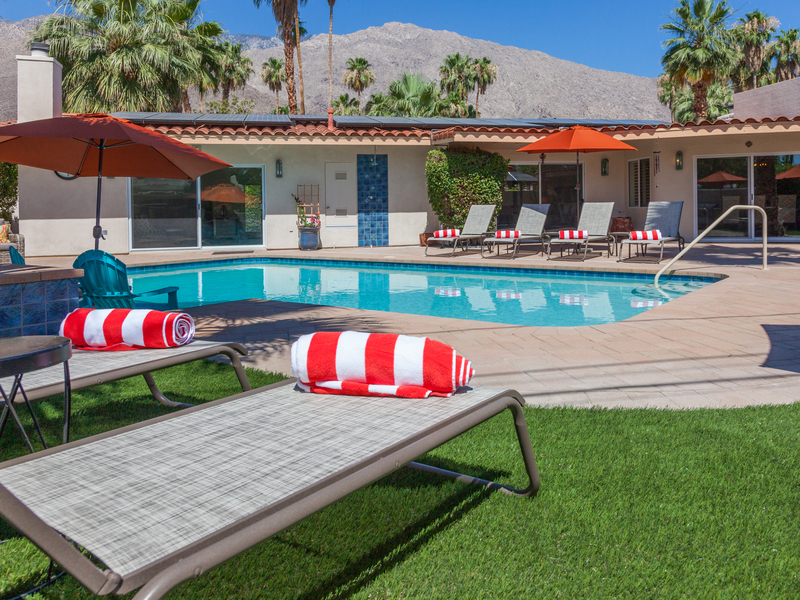 I would not look any farther for a place to stay if I was going to Palm Springs again! A haven it is indeed!" Manager Response: Thank you Teresa. You were a great guest and yes, Hidden Haven is a very special home. We hope you will come back again soon! 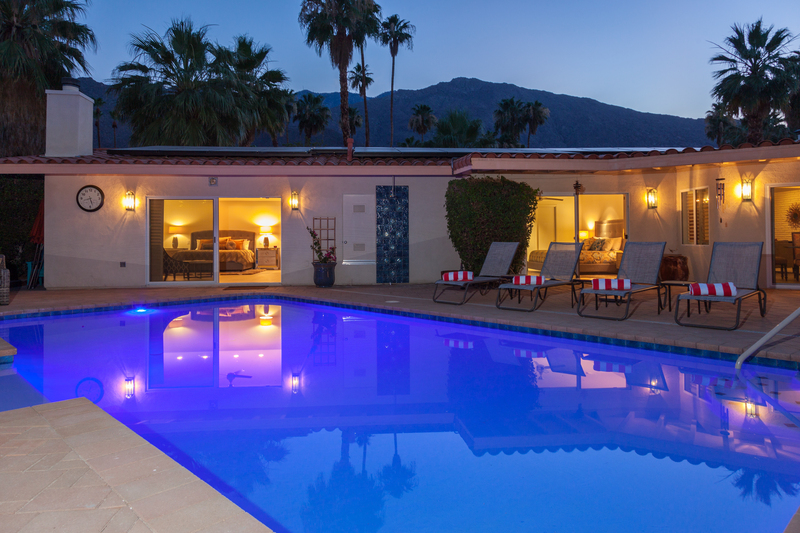 "It was Valentine's weekend and we had a wedding to go to in Palm Springs, so me and a few girlfriends were lucky enough to spend a wonderfully relaxing few days at Hidden Haven. The master suite is outrageous--it is huge, with its own bar, and you can literally leap from your bedroom into the pool which, I might add, was the PERFECT TEMPERATURE. 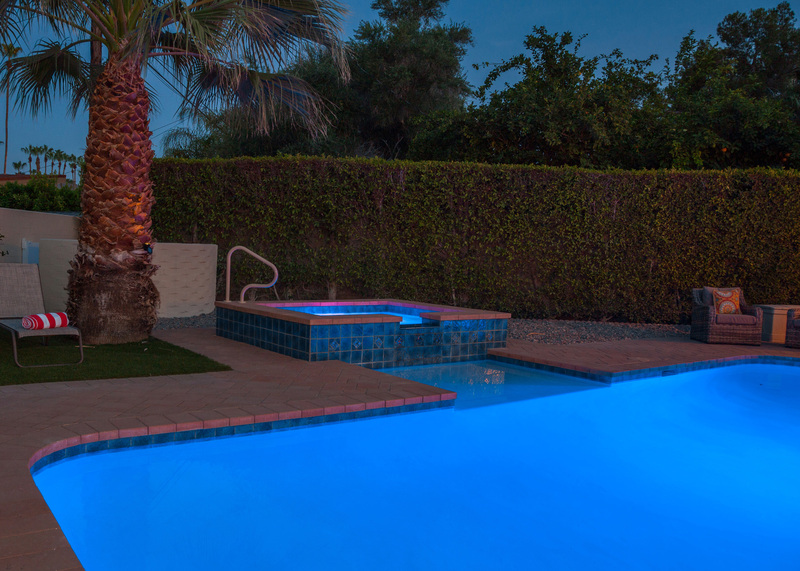 At night, both the pool and hot tub lit up in various beautiful glowing hues. 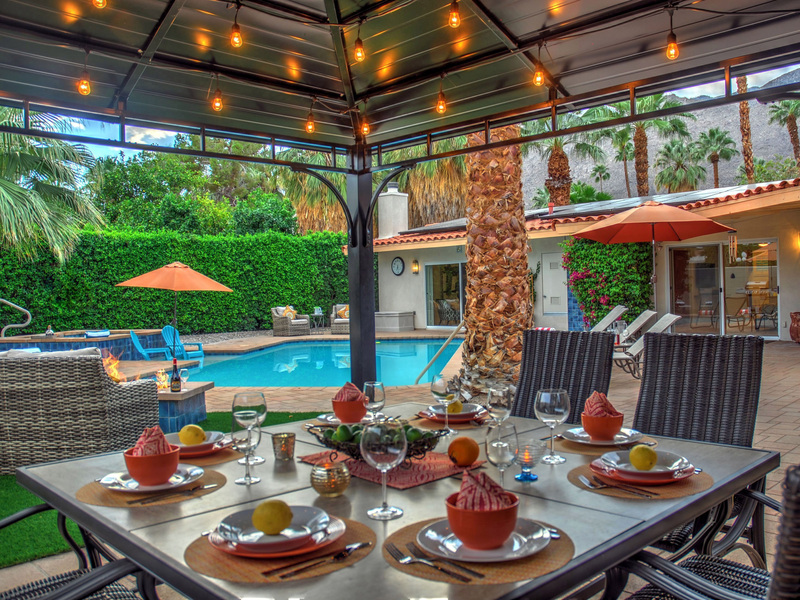 There's a wonderful, shaded outdoor dining area, and a delightful fire pit. 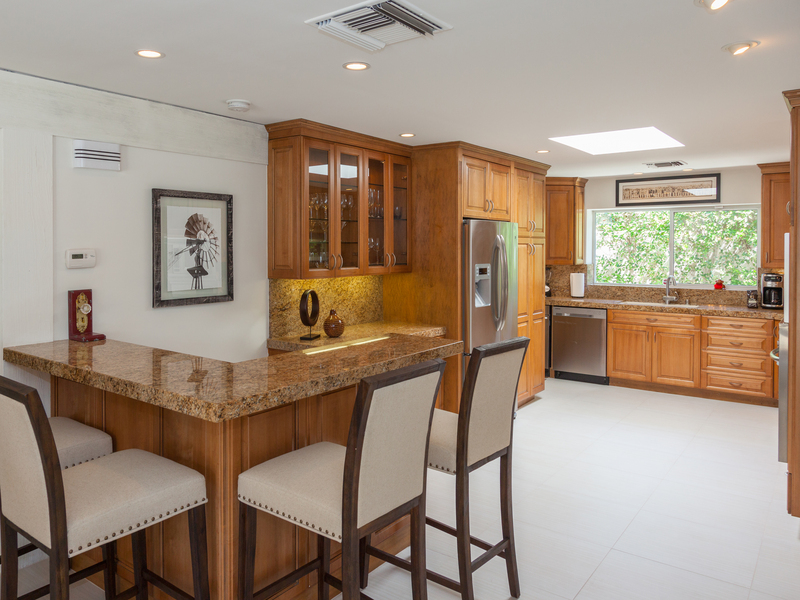 The kitchen and living area lend itself to gatherings -- in fact, the whole house seems to have little corners where friends can gather--around the fire pit, around the inside fireplace, in the hot tub. The outdoor shower was a wonderful touch. I had to tear myself away to go to the wedding, and we ended up inviting some of the wedding guests back to our place. I can't wait to return." "Love, love LOVE this place. 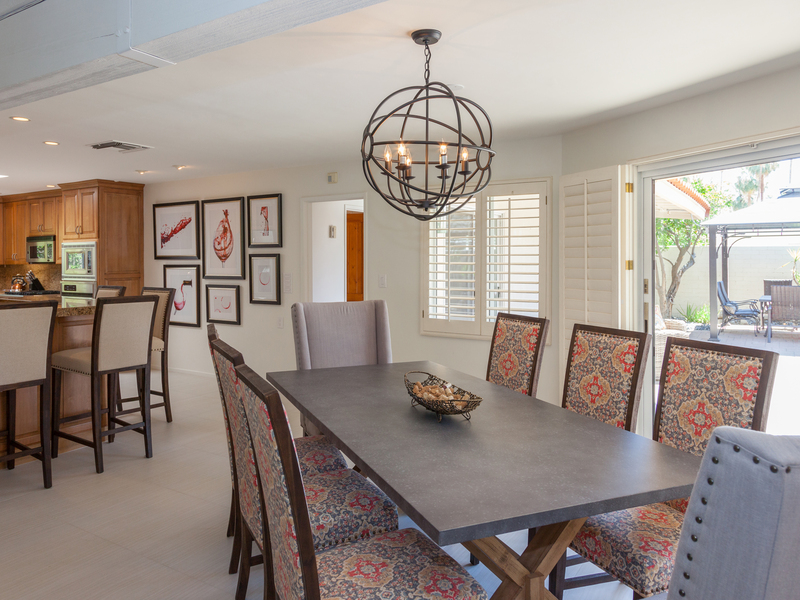 Beautiful decor and nice lighting, comfy, luxurious beds and sofas, perfect pool and hot tub; kitchen has everything you need to entertain and serve meals indoors or out--perfect for gatherings of friends and parties. Felt very restorative, but super fun at night! I'll be back." "This house is perfect for a getaway. Very clean, and modern! This house was very spacious and suited 6 of us comfortably. Loved having a place to call home away from home! " "This was like escaping to a very cool boutique hotel or our own private mini-estate. We loved how private it was. Nice quiet neighborhood. Great bedrooms - all with en suites. Beds were so comfortable. The living room is to die for --- sooooooo comfortable. The pool yard was complete perfection. Thanks! We'll be back!" 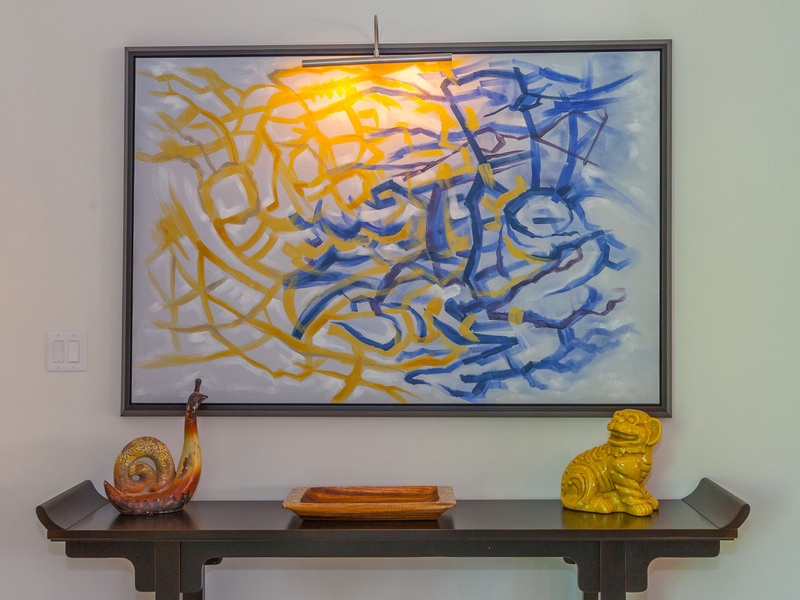 "My husband and I, along with 4 other couples, rented this house for my 60th birthday. We had a fantastic time and the accommodations couldn't have been any more spectacular. 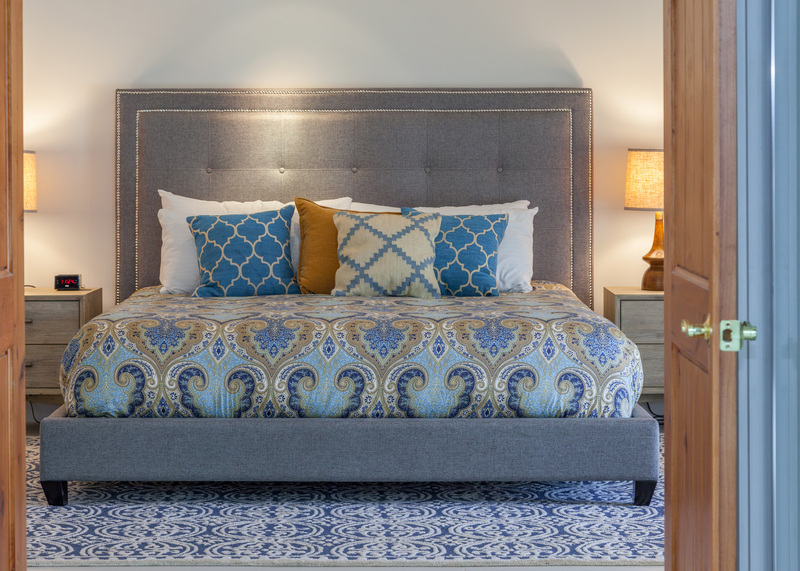 All the beds were comfortable and as well as the rest of the gorgeous furniture placed throughout the house. The kitchen was huge so several people could be in there at the same time without bumping into each other. 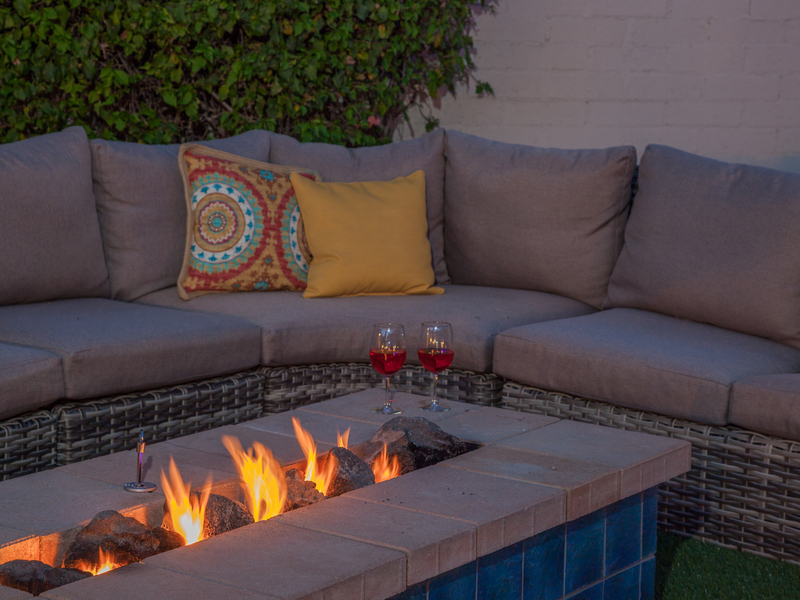 The outdoor space was also really comfortable and we enjoyed the outdoor firepit the most. We ended up spending much more time at the house than we originally planned because it was so peaceful and beautiful. All of us wanted to move in an stay forever!!!" One of the nicest houses! "The house was fantastic, but the management company was exceptional!!! You guys responded to our needs immediately, and we have never had a better response in any Vacation ental we've ever stayed in. Also, this house was immaculate, gorgeous, and the furniture and beds were so comfortable! You met all of our expectations!" Manager Response: Thank you Kim. We strive to provide every guest with a 5-Star experience. Feedback like this from a seasoned vacation home renter like you means the world to us. And yes - Hidden Haven really is gorgeous and the Property Owners are great Partners. Don't forget to use your Past Guest Discount when you make your reservation to return! We enjoyed every minutes of our stay! "Everything was perfect, from prior our arrival up to our departure. The application is very well structured. Our arrival, and the house were impeccable. Beautiful property! 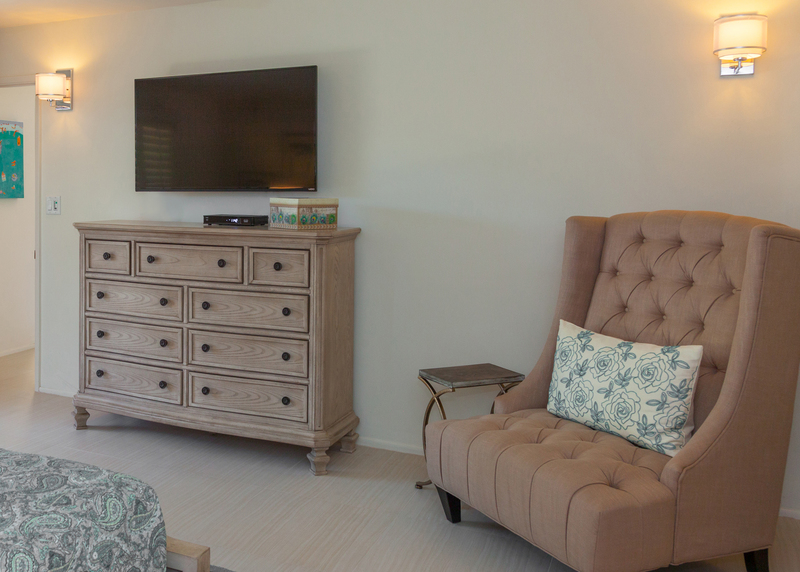 We loved our experience with ACME House Co.! " The backyard was the best part! 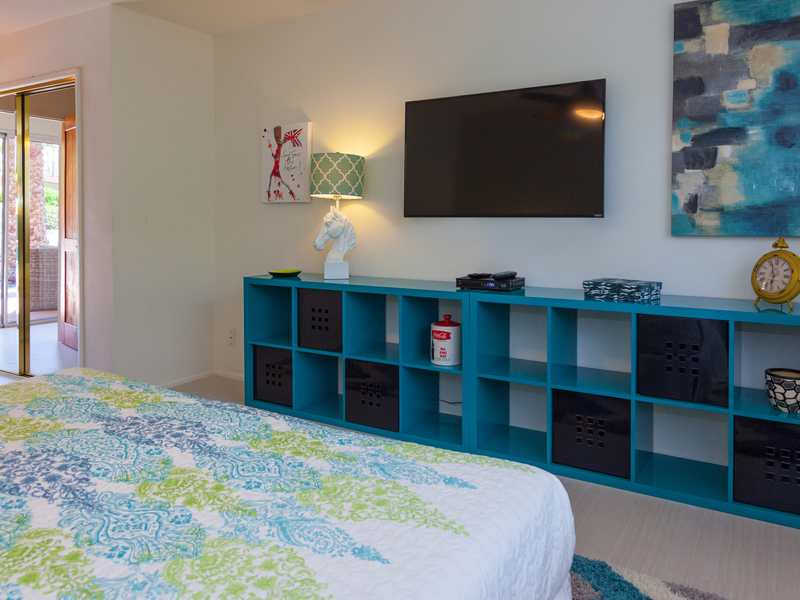 "Hidden Haven was a very nice, comfortable house with amazing amenities. We liked how close it was to downtown, and that it was very easily accessible to shops and restaurants. We liked the number of bedrooms, the cleanliness, and the size of the rooms. The pool and backyard were amazing, and we never wanted to leave. " 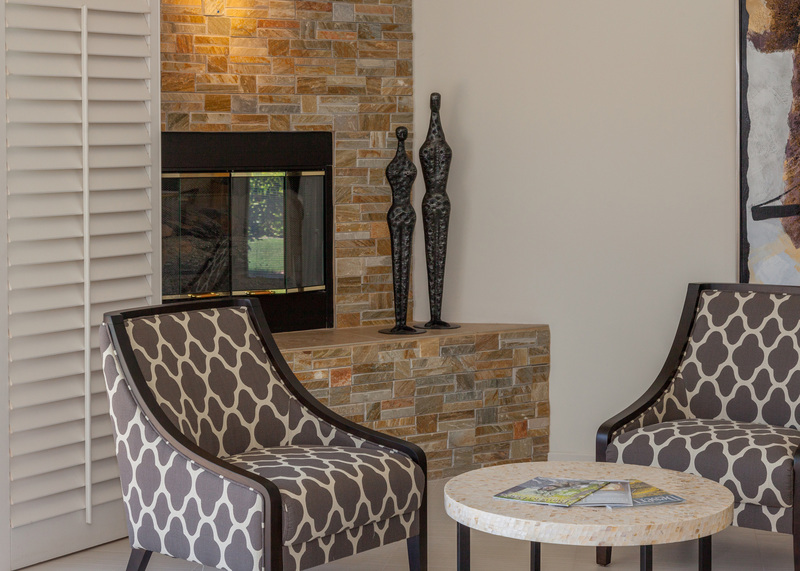 "We chose this property because I trust our Reservationist Renee. She knows what we like, and makes the process easier. The backyard was perfect, and the pool water was nice and warm!!! Our family loved it! Acme House Company arranged for Palm Springs Santa to stop by for a visit - our granddaughter LOVED it! Thank you ACME!" Manager Response: Ho! Ho! Ho! Santa reported back that you were very good guests! Glad you enjoyed and we look forward to your return! 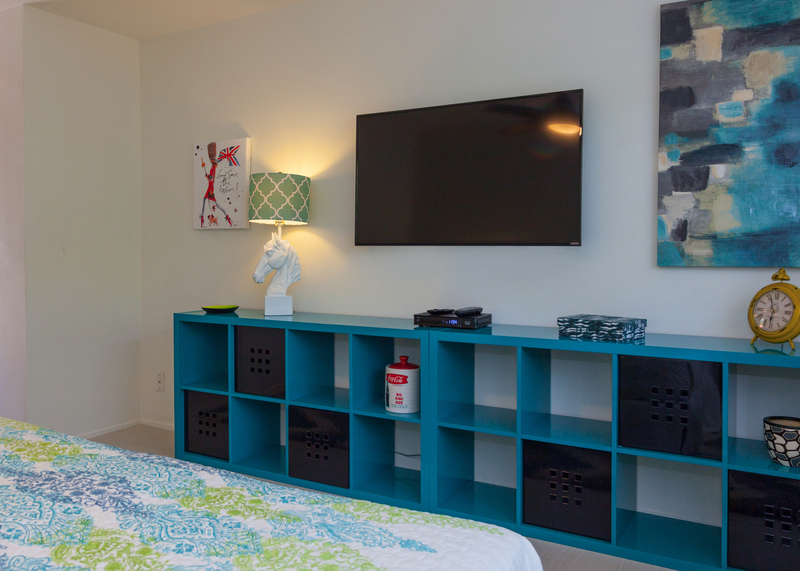 "ACME House Co. was wonderfully responsive to our needs and interests from the time we first investigated our rental right through check out. We had a less than desirable experience with another rental company and ACME's service and pricing program was clearly better. We found the mattresses in two of the four bedrooms to be sub-standard, and ACME immediately had them replaced. That was extraordinary. After replacing the mattresses, "housekeeping" arrived to re-make the beds! The home was amazingly well-equipped, and we were able to cook and enjoy ourselves as if we were in our own home. " Manager Response: You were the most gracious of guests Mr. Kornfeld. Yours was the first negative feedback we had about those beds - sorry for the inconvenience. But we are glad we were able to accommodate you quickly. Hidden Haven is definitely a very special property and we look forward to your return. 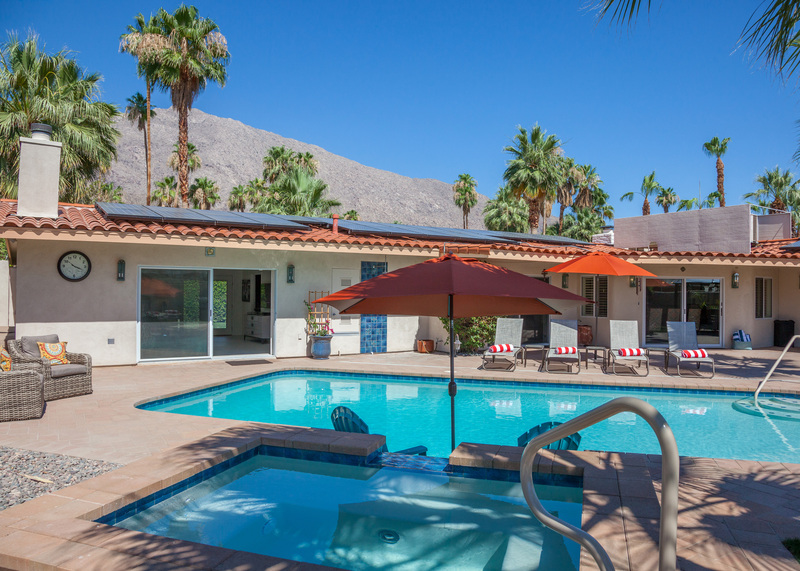 "We rent vacation homes in Palm Springs a few times a year. This was one of the few reasonably priced houses that had the four bedrooms/four baths we were looking for - so we decided to take it at the last minute. Hidden haven is amazing. I do not think we will ever stay anywhere else when n Palm Springs. 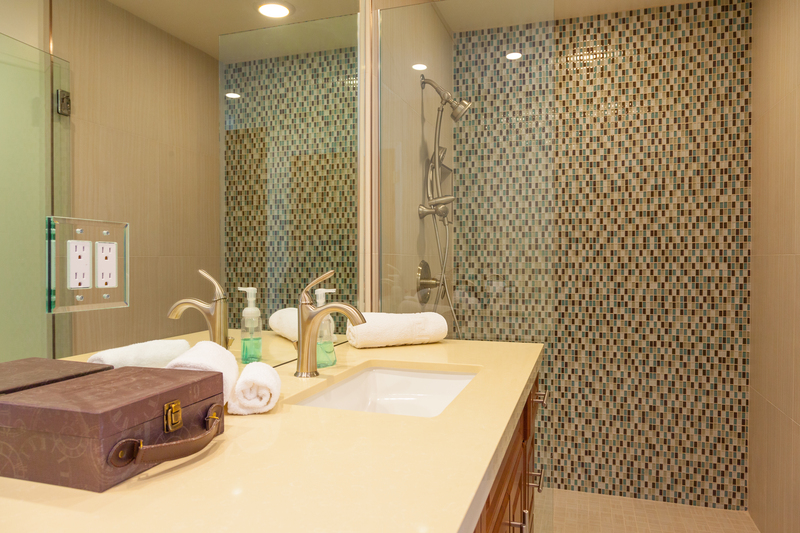 Gorgeous, comfortable, immaculate - and the people at Acme House Company are so very nice and accommodating. We drank a lot of wine in that back yard." 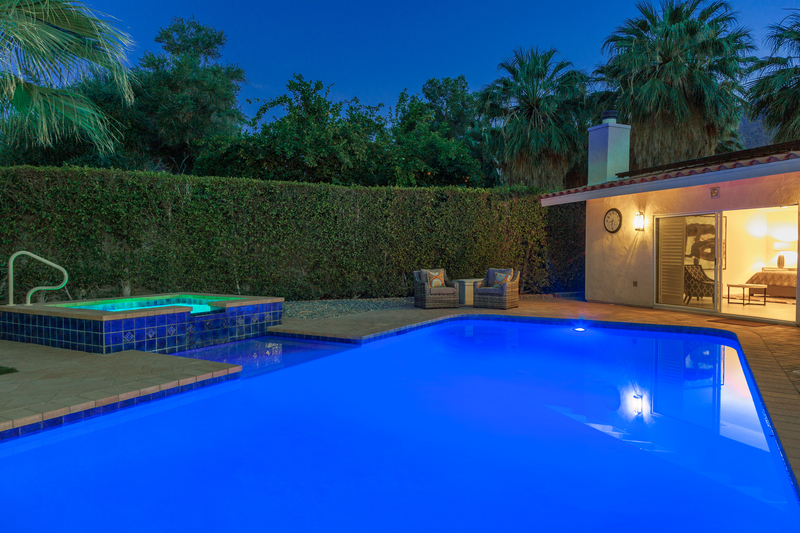 "The service was splendid, the house, and pool were beautiful. The property had 4 king beds and 4 bathrooms for 4 couples, perfect! There was an issue with something, we called to have it fixed, and it was taken care of right away. We would definitely stay at Hidden Haven again. " "My friends rented Hidden Haven and kindly invited me down for the weekend. As a last minute guest I expected to get the worst room in the house. But every room was great. All with comfortable king beds, private baths, televisions. Truly this was like a really cool boutique hotel. The pool and spa were dreamy. The mountain views were incredible. Each day we walked to Koffi for our morning java and we had a lovely dinner at Europa which was only six doors down from this gorgeous hide away. Great location! Wonderful house! Beautiful pool! I will be back!" "Amazing! 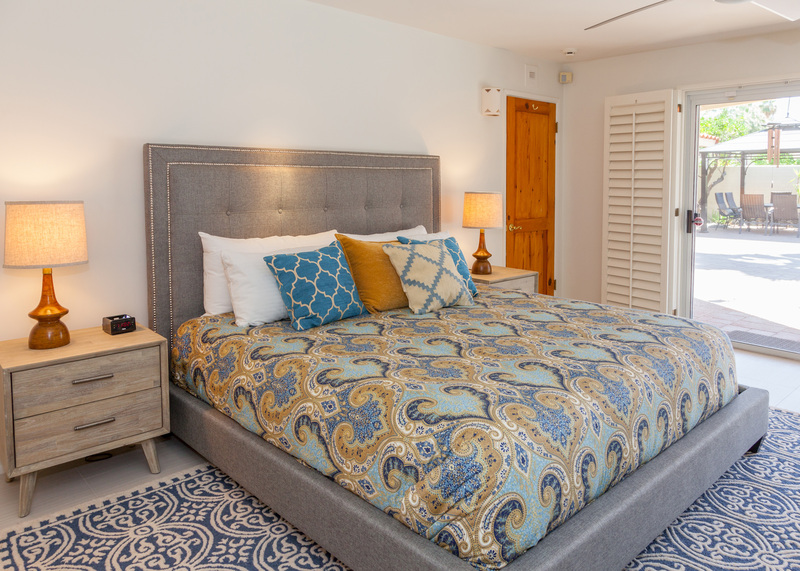 We recently had the privilege of staying at Hidden Haven with two other couples, and it was everything we could have hoped for in a vacation rental. 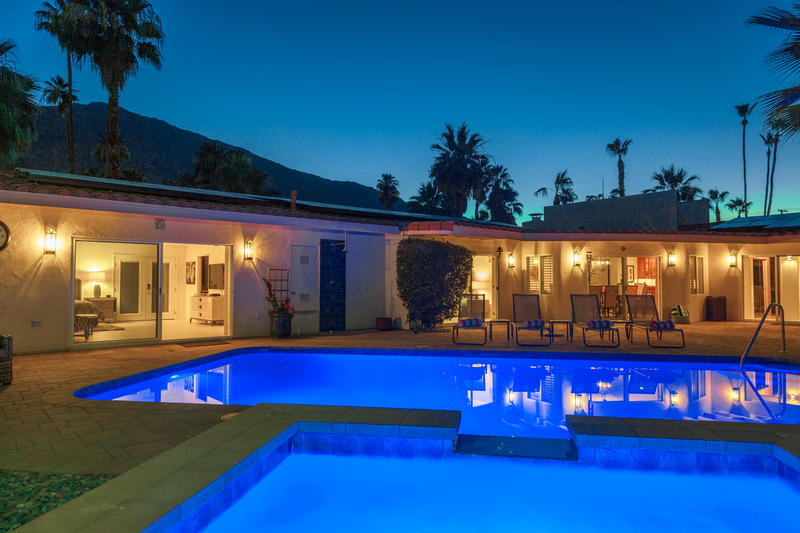 We have been renting in Palm Springs for many years and this is, by far, the best place we have stayed in. The interior of the home is beautifully decorated and extremely comfortable. 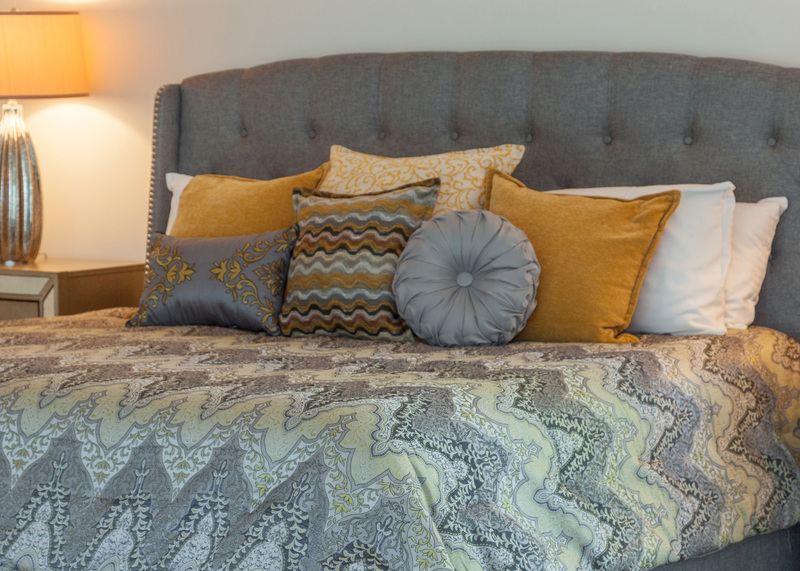 The beds and pillows are very comfortable and every detail has been thought of with this home. Although there were six of us, we never felt crowded or on top of each other as there are plenty of private spaces inside and out. The fact that each room has its own slider to the backyard was a huge bonus. The backyard space is glorious. 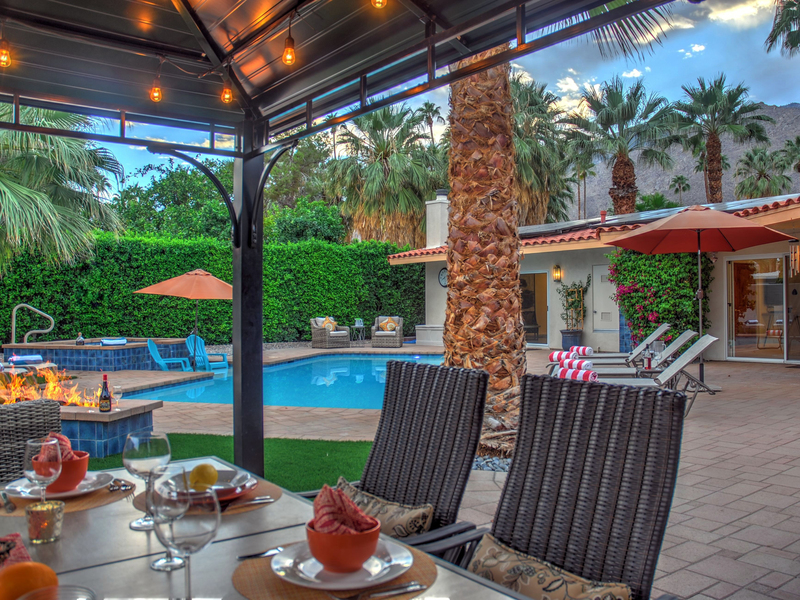 The pool, tanning shelf, gazebo, fire pit, and abundant seating is completely private with an amazing view of the mountains, sunsets and stars. Another bonus was the fact that we could walk to local restaurants and if we wanted to go into downtown, we just walked to the end of the street and caught “The Buzz” trolley which runs every fifteen minutes. We hardly used our car! We would highly recommend Hidden Haven and will most certainly be returning soon! "